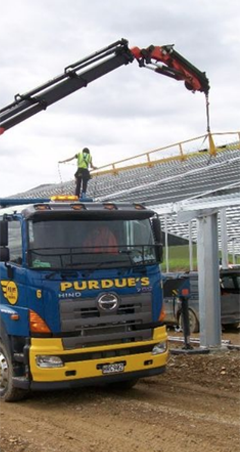 Purdue Bros Ltd | Home | Southland crane fleet, contractor truck, & specialised equipment. 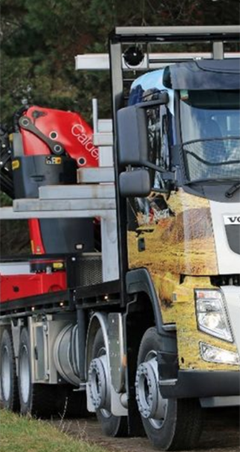 Get a company-branded truck with crane on the road without the expensive maintenance and running costs. We can take care of your specialised transport requirements including over dimensional loads for boats, houses and planes. We have a large, specialised crane fleet for a wide range of projects and all operators are certified. 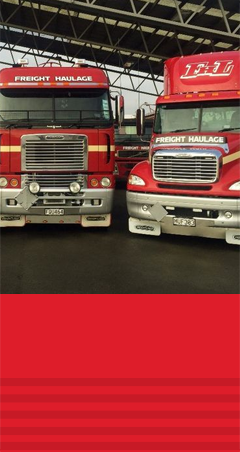 For all your transport and specialised equipment requirements. 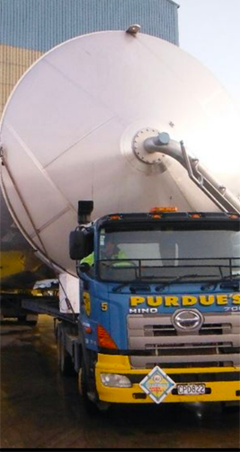 Purdue Bros, one of Southland's most respected transport companies, began business in 1947. Today the company has a fleet of ten trucks, eight of which have truck mounted Palfinger Cranes. Purdue Bros has specialised equipment to enhance the cranes, making them capable of transporting 27-metre long-run iron with a trombone trailer or carry out a 12-tonne lift. Crane accessories, including an auger, pallet fords, workman's basket and concrete bucket also enhance the productivity and range of options available. Class 1 and Class 2 pilots are available for any over-dimension loads.